Anyone would know I have nothing against photographers, in fact I spend a lot of time with them and love being part of the art we create. But this is always planned, agreed and considered art, where I am not only thought of as their subject but a valuable part of the whole process and most importantly know and have a say in what the outcome will be. However, I’ve never been keen on people taking my photo without my knowledge, especially if I’m relaxing or enjoying myself. Being a photograph’s subject has little place in my life in those moments, these are my private moments and I should be able to choose who I share them with. This is where paparazzi come in – celebrities and public figures have had to give up their right to a certain degree of privacy and become “public property” even in their down times. Now I ask this, have Goths now been forced to do the same? In the past few years Whitby Gothic Weekend has been attracting more and more photographers, to the point where it has started becoming a real problem. 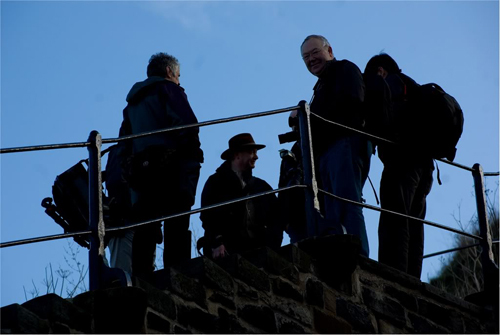 As dan_yorkshire from the talkphotography.co.uk forum says, “There are more photographers than seagulls!!”. Indeed I went through a countless number of photographer forums and the majority of them had at least one post about arranging a meetup in Whitby over the Goth Weekends. 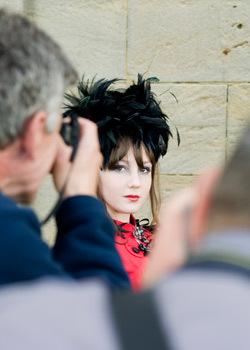 While there have always been photographers going to the festival, these days there are times when the “photographers very nearly outnumbered the Goths” as Debbie Stogden from debbiestogden-photography.co.uk admits. 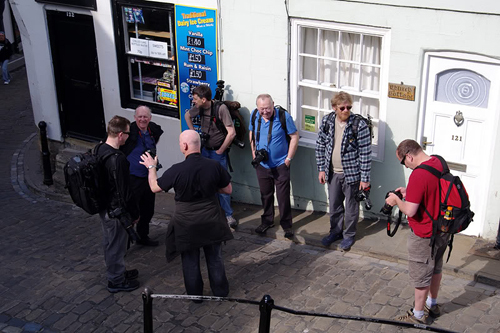 While pixvault from talkphotography.co.uk writes about a recent Whitby visit, “I swear the Togs outnumbered the Goths 2 to 1″. The rector of the Church on St Mary’s Hill announced shortly before November Whitby that he no longer wants people posing on and against the gravestones. This caused the first wave of uproar – among Goths, photographers, and Whitby visitors alike. While I personally don’t have a problem with people posing on or near gravestones (and have myself in the past), as long as you are careful not to ruin them or be respectful if there is anyone actually visiting them and stay away – I think they are beautiful objects and make for wonderful photographs. There are of course people who disagree with that on religious or other grounds. Indeed I think doing provocative or scantily clad shots in graveyards are in poor taste, but similarly some would think simply being Goth in a graveyard is in poor taste – so it’s all just a matter of perspective. 1 Before you take a photograph of anyone, please ask first. 2. Don’t assume because another photographer is shooting a particular person/group there is an open invitation to a paparazzi style shoot, with everyone and their dog getting into the act, also a group of photographers appearing as if from nowhere ‘jumping on the shot’ crowding the subject, can be very intimidating for the subject. 3.No means no, for everyone who likes having their photograph taken there’s someone who hates it, a refusal isn’t anything personal. 4.Give the subjects some respect, someone chewing a mouthful of pizza will never look dignified, no matter how good a photographer you are, and just because a person is wearing a flimsy costume, it doesn’t automatically mean he/she wants to show more flesh than already on display. 5. Don’t invade a person’s individual space, that means not pointing a lens directly up a person’s nostril or down a cleavage, unless invited to do so. 6. Consider the subjects feelings, if taking a group shot, don’t exclude the person with the least exotic costume, or concentrate on the person with the most interesting looks/costume. 7. Avoid taking individual shots of children, and if in a group shot ensure you have the parents/carers consent. 8. If possible provide contact cards, with your E-mail/web address and if the images are to be published (blog/forum/web site etc), give the subject this information, with a provision for anyone who wishes an image(s) to be removed for any reason, the image will be removed. 9. If using a DSLR with a rear screen, show the subject the images you have taken, and if the subject is unhappy with the image, delete the image. 10. Avoid taking photographs on the steps leading up to the Abbey, apart from the fact most folk are knackered climbing the steep steps, and not looking too elegant, the steps are quite narrow with steep drops, taking photographs is unsafe, both for the photographer, subject and the poor folk who have to navigate round the shoot. Bobby Canon from talkphotograhy.co.uk raises a valid point – and one which I have raised myself before, “I myself have stated that it is a case of both Goths and photographers “feeding” off each other. So long as there is one Goth type posing, others will want to pose, and so long as one solitary photographer is seen taking photos, others will follow for their share of the action.” Whitby is also attracting a lot of people who aren’t necessarily Goths but who come to the weekend for the chance to dress up. Perhaps they feel they couldn’t dress up like this anywhere else or feel comfortable with the accepting nature of Goths. These are both great reasons and it’s nice to know people feel WGW is a safe friendly environment for them. But I do feel this again waters down the weekend and makes it less about Goth. B&Bs get filled and restaurant seats are hard to find, the streets get jam-packed during the day. Fewer then pay the money and support the bands at the event itself, the festival was at risk of closure due to lack of financial support and yet the town is full to brimming. Goth is most certainly a look and a way of dressing, but there is a whole scene, music and lifestyle beneath it and I wish those who chose the look would embrace it all. It would seem that it’s generally these people who most enjoy their photograph being taken (I have to deduce this as paging through all the random online WGW photographer albums, I recognize very few people – and I can confidently say, I know a fair few Goths…). fatspider of pentaxuser.co.uk says of one such person, “the older couple she was with virtually pushed her in front of the camera, and she herself voluntarily leaned forward and thrust the aformentioned endowments at the camera.” So do people really just go to be photographed? davidtrout and techno-terminator from the same forum seem to think so “there were some stunning looking woman dressed up especially for us photographers” “I strongly suspect that your subjects were very happy to be photographed – that’s why they were there, all dressed up, to catch your attention.” cantona43 from ephotozine.com agrees “They love posing for the camera or they would not dress up like they do and attract attention.” So while there may indeed be some who dress up just for the photographers, the majority of people I know personally, do not. Yet as we choose to dress in the way we feel comfortable and enjoy (in an environment which is essentially where we should most be able to do so – being our festival and all), in the minds of these photographers we are effectively asking for it. Bobby Canon goes on to say, “we will find ourselves ostracised by the Gothic community, and have many heads turned away when we approach them with camera in hand. They will, rightly or wrongly, ulimately blame us, the photographers, for spoiling what is meant to be “their” weekend. There are already a fair number of them already feel this way. We should all think long and hard about this, and instead of trying trying to analyze the situation to find out who’s feet to lay the blame at, we should all act together as a group (photographers and goths, and also fancy dress people) and try to keep the good relations we have with each other going.” Which is an applaudable view and I was completely with him until he went on to say that if photographers continue to act in an undesirable manner “we may be killing the goose that laid the golden egg.” Ultimately we are just something for them to use and gain from no matter how nice they are. Indeed many claim to have won photography club competitions with their photos they took of people at the Goth Weekend, as whipspeed at ephotozine.com attests to. Others get published in magazines: davidtrout at pentaxuser.co.uk gets kudos for his article Pentax User magazine, others still sell their images: I’ve found stock images for sale at www.photographersdirect.com and www.istock.com and prints at www.picadore.com for as much as £123. One person in the Whitby Goth Weekend facebook group even claims to have seen a photographer charge between £8 and £600 for the images he took around St Mary’s Churchyard. Let alone the pictures being posted in all these online forums for people to study, critique or make fun of. But it’s not just the profits and kudos they gain from our image with no recompense that worries me, the people in the pictures have no say what or how their image is used. Stock photos can be used for any purpose from advertising to accompanying a news story – how would you feel if your picture suddenly popped up in less than desirable place? In UK the only rights we have to how photographs of us are used, is if the image is used in such a way that it paints us in a negative light but even that requires a court case to prove. In fact photographers are completely within their rights to take photos of people in public places without their subject’s consent, and they don’t even need a model release for use of that image. The law is unfortunately on their side in this regard (see my article on copyright). It’s no wonder mniwh from eos-magazine-forum.com is pleased when he finds out about WGW and says it’s otherwise “difficult to get willing non paid subjects”, because most models realise what they are giving up and their exact worth to their photographers. It’s quite unfair that a place which has become a haven for all those who want to dress exactly how they please (whether or not that outer image is sprung from a deeper scene and whether or not you agree with the way they dress) has become a place where photographers flock to, some of which treat us no better than animals to be herded, hunted and used. Where the blame for this lies, is no longer a relevant question. The question now lies – what do we do about it? Why did you not ask my permission to use my photograph? You also say All contents copyright Amaranth?? I think not. *smiles* I’ve changed the copyright at the bottom of my site, hope that makes you feel better. I also hope this little bit of outrage you display here gives you a slight insight into how many people feel when their image and personal space is used in ways not to their liking. It would seem that you misread my mood. I never get outraged about my material being used; quite the opposite in fact as long as I am informed first and credited (the later you did). I shoot a very large amount of material in the public domain and always offer an email to the subject should they want free copies. Your article is biased generally and although it raised relevant points, seems to have caused more issues than it could have otherwise resolved. What’s done is done and most will learn from the comments and the article in general. There will always be self-righteous TOGS out there though, that taint the events with their ignorance and attitude. Thank you for your more reasoned reply. I would agree my view is slanted (isn’t yours?) as it’s a problem myself and many of my friends experience first hand every time we go to whitby now (and from comments all over the web I’m seeing that this is actually happening world-wide and at almost every alternative festival). There are so many people who won’t even go into the old town during the day and actually choose not to dress up if they do in case they become tog-fodder: which is a real shame considering it’s a goth festival and a place where we should feel we can go about our business without being hassled. As for causing more issues, again perhaps you are not quite in touch with the actual gothic community, I do not know many of the people I see in the photographer’s whitby albums and I welcome someone to come in and represent them – but there are hundreds that feel exactly the same as me and sometimes even stronger and this anger has been bubbling under the surface for a few years already. Perhaps we’ll get so sick of it and leave whitby to become the “Alternative Models and Photographers Event” and we’ll go elsewhere, in a private, guarded and secured location – hidden away because certain people don’t understand we are not a spectacle purely created for their enjoyment nor a place for people to tag on to because they want to feel like models for the day. How ridiculously sad does that sound? Out of interest, if you like goths so much – have you ever considered buying a ticket to the actual event? This is actually quite shocking, especially the clear oggling aspect of it. WGW and the steampunks event at Lincoln Asylum are private gatherings in public places and I for one dont appreciate the mass attacks described above. I remember being on the phone to my doctor at WGW making an appointment as i was feeling ill, the next thing there was a photographer pointing a lens in my face because she wanted a pic of a “Goth on the Phone” I politely told her to go away. I dont like having my photo taken. At WGW dress as i want to, as although i would love to wear a corset and bustle everyday, its just not possible. . I HATE my photo being taken! I dress up for myself not for some (often perv) with a camera!